As health professionals who care for athletes, you play an important role in preserving the integrity of competition and the core principles of true sport. Athletes and support personnel depend on health professionals to help guide them in making good decisions. Understanding anti-doping rules is essential to ensuring success in program compliance and clean competition. As such, it’s essential that health professionals understand anti-doping rules to ensure program compliance and protect clean competition. In addition, physicians who treat recreational and/or elite athletes governed by the World Anti-Doping Agency rules and regulations are also subject to anti-doping policies. Failure to adhere to these policies can result in anti-doping rule violations and sanctions for both the athlete and physician. HealthPro Advantage was created as a resource for any physician interacting with athletes and for medical professionals in ALL FIELDS, from Orthopedics to Sports Medicine. The course is particularly valuable to medical professionals because they are on the front line treating and advising elite and/or recreational athletes governed by the World Anti-Doping Code, and are similarly subject to those anti-doping policies and rules. Major Games Anti-Doping Specific Information. Access HealthPro Advantage through the Stanford Center for Continuing Medical Education portal. Learners will engage in the educational activity via interactive text, animations, videos, and case-based studies. The Stanford University School of Medicine designates this enduring material for a maximum of 1.25 AMA PRA Category 1 Credits™. Physicians should claim only the credit commensurate with the extent of their participation in the activity. Physicians will be awarded AMA PRA Category 1 Credits™. All other participants will receive a Certificate of Participation upon completion of the course. *This activity has been planned and implemented in accordance with the accreditation requirements and policies of the Accreditation Council for Continuing Medical Education (ACCME) through the joint providership of Stanford University School of Medicine and United States Anti-Doping Agency. The Stanford University School of Medicine is accredited by the ACCME to provide continuing medical education for physicians. Get information on medication, TUEs, supplements, and prohibited substances. Determine if a TUE or medical exemption is needed for the use of prohibited substances. Understand the issues associated with dietary supplement products and learn to reduce risk. Use Global DRO to check the prohibited status of generic and name brand medications online. 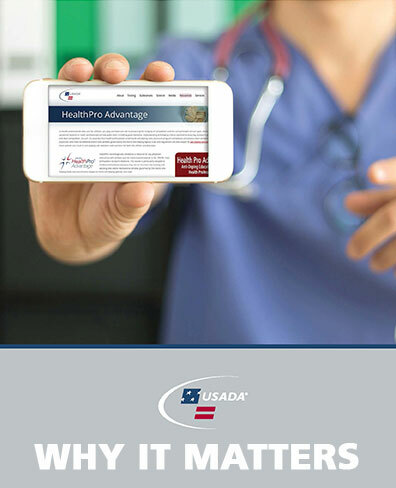 USADA’s drug-reference phone line provides an expert during business hours to discuss drug information. The WADA Prohibited List outlines the substances and methods prohibited in sport. Understand the blood & urine collection processes from notification to the shipment of the sample. Important anti-doping considerations that should be understood in preparation for surgery.